High performance acrylic adhesive permanently and conveniently bonds to metal, wood and other RV component materials for permanent attachment without mechanical fasteners like screws, rivets, spot welds, and nails. High bond tape reduces the need for additional tools, labor and cleanup, which saves you time and money. Comparable to 3M™ VHB™ tape, foamed acrylic is constructed of a solid mass of adhesive, giving it superior internal strength and high bonding performance. 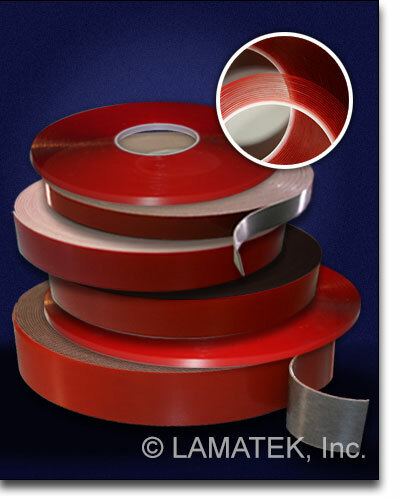 Acrylic adhesive tape resists UV rays, weather, water and wind while absorbing vibrations and noise. Available in slit-to-width rolls, on spools for continuous application, or custom die-cut and kiss-cut in rolls or sheets. High bond tape can also be supplied with a double-liner (poly liner on both sides of adhesive) for aftermarket assembly and more. Very high bond tapes outlast mechanical fasteners that wear out over time from corrosion, friction and stress caused by weather, impact and continuous vibration in transit. Durable foamed acrylic tape saves time and money by eliminating screw attachment as well as replacements down the line.